Libraries continue to fulfill their historic role as information centers and sources, even as the internet has made so much data available. At the same time the role of the library in helping people deal with one of the specific matters in this survey is changing. Use of libraries as a source for dealing with these matters is higher among those who are younger and those with lower incomes. One in five, 21%, of those in Generation Y (age 18-30 years) say they sought information or assistance at a public library. Those in the oldest age group, age 72 years and older, are next most likely, at 15%, to use the library. This compares with just 11% of those in Gen X (age 31-42 years) and most of the other age groups. Income is also a significant variable: 17% of those with incomes under $40,000 say they went to the library, compared with only 9% of those with higher incomes. More than one in five African-Americans (26%) and Latinos (22%) went to the library, compared with 9% of white Americans. But there were no differences by education or gender in problem-oriented library use. Nor were there were significant differences between internet users (13%) and non-users (11%); or between those with low-access to the internet (12%) and high-access to the internet (13%). Two of the contradictory themes of internet use – access and income – converge in the problem-focused use of libraries. 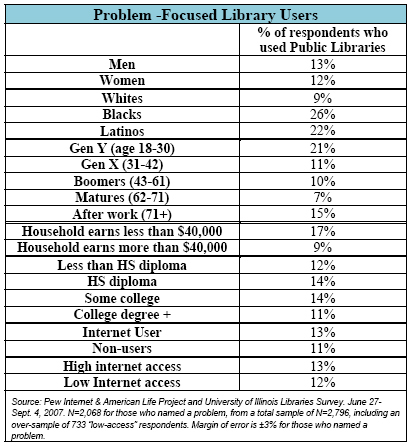 Among these users of the public library, the highest rate of usage is among those who have high internet access and also have low incomes. This is a result of the large number of young people who have high-access to the internet and yet have relatively low incomes because they are still in school (perhaps part-time) or are starting out on the lower-paid steps of the career ladders they have chosen. Which problems drive people to libraries? People will most often turn to the libraries for information or help with six specific matters. Among those matters, one in five respondents (20%) say they went to a public library to address educational matters. About 10% went for help or information with changing job status, health, taxes and Medicare/Medicaid. Nearly as many, 7%, went to libraries with concerns about Social Security or military benefits. Which resources do people use at libraries? More than two-thirds of those who went to the public library (68%) used a computer there, indicating an impressive change in the role of public libraries. In addressing their specific problems, a total of 65% used the computer at the library to look up information on the internet; 62% used the computers at the library to see what materials the library had to offer; 58% used the reference materials at the library; and 42% used the newspapers and magazines. One demographic group did stand out: African-Americans were by far the most likely to report using the computers at the library, with four out of five reporting such activities. For comparison, just over half of white library users reported such activities at the library. Those who use the public library to look through newspapers and magazines in these cases have a decidedly younger bent. More than half (51%) of those in Gen X and Gen Y (ages 18-42 years) say they did that at the library, compared with 29% of those older than age 42 years.11 This may be a reflection of the reality that younger Americans are less and less likely to be subscribers to print publications and more likely to report reading them online or elsewhere. Did people get personal help at the library? Many people found help from the library staff. Nearly seven in ten library users (69%) say they received some assistance from the library staff on their visits. Among those who did not receive help, 91% say they simply did not need it. Thirty-nine percent of library users report receiving help on reference services and 38% report one-on-one instruction in using computers or the internet. Sixteen percent say they received help using printed materials. Six percent say they used an electronic or interactive help system and 4% say they received tutorials or took classes from library personnel. Seven percent reported using some other kind of assistance. The library users who did receive help were quite satisfied. Nearly four in five (79%) say they were very satisfied with the assistance they received from the library staff, and 19% say there were satisfied. Only 1% said they were unsatisfied. Library help is effective. Among those who received help at the library, 88% say they found a lot or some of what they were seeking, including 38% who say a lot. By contrast, among those who did not seek help at the library, only 53% found a lot or some of what they were seeking, including 29% who say a lot. Libraries offered the most help to those seeking help on Social Security and military benefits, and also Medicare, Medicaid and food stamps. Fully 58% of those looking for help about Medicare and Medicaid and 54% of those looking for help on Social Security or military benefits found a lot of what they were seeking at the libraries. Those looking for help in other areas found the libraries slightly less productive; 40% of those working on employment matters found a lot of what they needed, compared with 39% dealing with health matters, 30% dealing with education and 28% dealing with taxes. When people don’t go to the public library. If public libraries are good places for some people to find information and assistance, why don’t more people turn to them when addressing matters or problems? One in ten people who faced one of these matters (10%) thought about going to the library but did not do so.12 This suggests that a key challenge for librarians is to make sure that those who consider the library as a potential problem-solving resource actually recognize they can use the library. Those who considered going to the library, but ultimately chose not to, are similar in many respects to those who did go to the library. One group that stands out is that 30% of the Latinos thought about going to the library but did not, in contrast to 10% of the overall population who behaved likewise. Among those who chose not to use the library, 13% obtained the information or assistance elsewhere; 11% found the information online at home; 11% had the information at home; 10% found the information online somewhere besides home or the library. The rest had other reasons for not using the library, including inconvenience of using the library, a shortage of library holdings, a dislike for libraries, and other miscellaneous reasons. Will the public library be a strong resource in the future? Twelve percent of respondents say it is very likely they would go to the public library in the future for information or assistance in dealing with a problem, and 17% say they are somewhat likely to do so. Another 17% say they are somewhat unlikely to go to the public library and 54% say they are very unlikely to go in the future. Fortunately for the public libraries, their potential customers skew toward the younger age group. Fully 40% of those in Gen Y (age 18-30 years) say they are very likely or somewhat likely to go to the public library if faced with a problem in the future, compared with 25% of older respondents from Gen X (age 31-41 years). Income is also a determinant: 41% of those earning less than $40,000 a year say they are likely to use the library, compared with 22% of those with higher incomes. Among minority groups, the libraries are attractive: half of the African-Americans (50%) and 42% of the Latinos say they are likely to turn to the library, compared with 24% of white Americans.